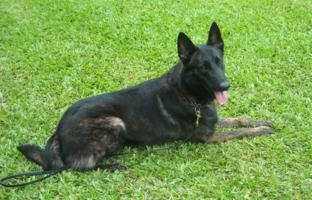 Storm, an Outstanding Arko Kikkert, Suttle x Truusje Son… He has EXTREME ball, toy, food, hunt drive. Storm has intense and fast obedience. Strong serious defense. Storm strikes like a bullet train and has full and hard grips. Storm has solid environmental nerves. He is very social and works well on slick floors, in crowds, etc. Storm has the ablility to turn on and off when not at work. He is OFA Excellent Hips & Normal Elbows.